This weekend was supposed to be a celebratory one for fans of The Walking Dead, and in many ways it was. The show returned to AMC for its ninth season and got off to a strong start, with an exciting premiere that promised an enjoyable run to come. But there was also some sadness in the air, as we lost actor Scott Wilson yesterday. As fans will know, the beloved talent played Hershel Greene for a few years on the show and his death came as quite the shock. Especially since only hours earlier, it was announced that AMC would be bringing him back at some point this season. 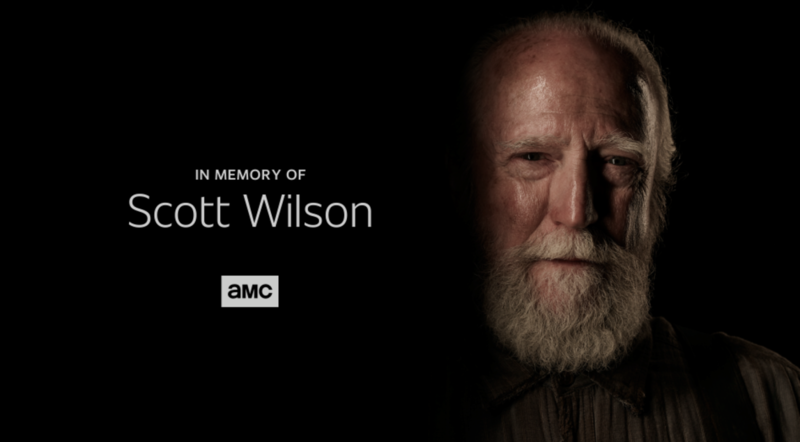 We’ve since learned that the actor had already shot his scenes, so we’ll still be seeing him appear once more on The Walking Dead, and though we don’t yet know when that’ll be, the network aired a touching tribute to him tonight. Seen in the gallery below, they put together a simple but powerful image to show their respect, which was displayed at the end of the premiere. As for how Hershel may return, that’s still a bit unclear, but we imagine it’ll be in the form of a flashback of some sort. Or maybe a hallucination. Presumably, it’ll also be connected to Andrew Lincoln’s upcoming exit from the show, which is set to occur in the first half of season 9. Chalk that up as speculation for now, though, as the details surrounding Rick’s departure and how exactly Hershel will be involved remain unknown. Still, it’ll be nice to see Scott Wilson back on The Walking Dead one last time, no matter what capacity he shows up in, and as soon as we learn more about his return, we’ll be sure to let you know.